Video marketing is the most effective form of content marketing. It’s versatile – you can use it to showcase yourself, your product or services, or even the facilities in which you work. Like with any form of marketing, there are best practices you can follow to ensure you maximize effectiveness. Here are eleven video marketing tips to help your B2B company stand out. No matter what type of video you’re producing, you should have a pretty clear outline of what you want it to say. However, avoid writing a word-for-word script. Your words should sound unrehearsed, delivered spontaneously. If your delivery sounds too stilted, your message may sound inauthentic. It’s fine if you don’t sound like a professional voice actor, because business owners would rather hear from someone they trust and believe in. Being a little unpolished or spontaneous can help you be more genuine. Your video should include a call to action, or CTA, at the end of it. A CTA gives your viewer the option to keep the conversation going. You encourage the viewer to find out more about your product by signing up for your email list, scheduling a demo, or some other activity that moves them closer to doing business with you. 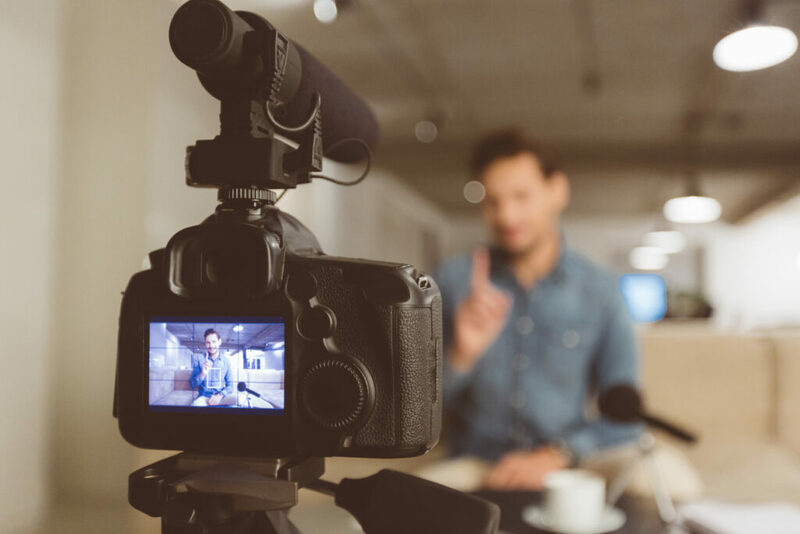 Making videos that include testimonials from other business owners you’ve partnered with is a highly effective marketing tactic. It taps into the concept of social proof. You advertise to future clientele that you are a reliable, trustworthy business partner. This will help back up any claims or data you share on your website about your proficiency and ability to provide winning solutions. Do you want to showcase a specific product? Tell the story of how you founded your business? Talk about your company’s mission? Provide a valuable tip for your target market? Provide insight into something timely that impacts your field of expertise? All of those are worthy goals. It’s critical to make sure that each video you record has a specific goal in mind, and that you don’t stray from that goal. One of the best video marketing tips: keep it simple. A video with you explaining why you founded your business is a great tool for your “About Us” page. A video explaining how your product works may pair well with your “Product Information” page. By sticking to one point for each video, you increase the chances that the viewer will absorb the message of each one. Dr. Robert Cialdini is a psychologist who wrote a 1984 book titled Influence. It’s one of the seminal works on the persuasion tactics used by salespeople. He identifies six specific principles that help them gain influence. One of them is the principle of authority. The concept essentially means people are more likely to buy when they think they’re buying from an expert or someone endorsed by an expert. By developing “explainer” or “how-to” videos on your chosen field, you position yourself as an authority on that topic. You demonstrate your expertise. Business owners are much more likely to trust you once they see you are an expert. Not all platforms serve the same purpose. For example, a video posted to LinkedIn may be more formal and catered to the professional audience. A Facebook video may appear a little less formal and appealing to a more personalized crowd with a human touch. A video posted to Instagram may be shorter, but more visually appealing than the others. You can even repurpose your existing content posted to one platform with alternative editing. Just make sure the style and content of the video fit the platform it’s posted to. Not all of your videos should be the same. Some may be specifically designed to showcase your product or services. Others may be more “slice of life” type videos, displaying how you and your company are active in your community. These both could be effective, but they shouldn’t necessarily share the same look and feel. Experiment with different types of videos. Create some that are stand-alone videos and others that work as part of a larger campaign. The highly effective digital marketer Gary Vaynerchuk has many great video marketing tips. His motto: “Document, don’t create“. Your audience wants to see your entire journey. This may involve some missteps and it may involve some brutal honesty, but audiences crave authenticity. Measure the level of engagement your videos have. Determine what content resonates with your audience and give them more of that. YouTube offers extensive analytics you can use to measure engagement. Use this to hear what your audience is trying to tell you about your video marketing and adapt your strategy to show that you’re listening. Male recording content for video marketing efforts. It doesn’t have to look like a Hollywood movie, but the video should be well-lit and the audio should be relatively clear. If it’s not a live streaming video, it should be edited in a way that doesn’t include choppy cuts that make it hard to understand the point of the video. Your video exists to communicate a message. If your audience can’t see you or can’t hear what you’re saying, they’re a lot less likely to absorb that message. Produce videos that are easy to understand. Give your audience the best possible chance to consume your content. The values, ideas, and concepts of your brand should be “baked” into all your videos. You want to produce content that is consistent with your business’s mission statement or strategy. They should also be unique. If you look at an outline of one of your videos and substitute your competitor’s name for yours, would anyone tell the difference? Make sure that you showcase the “secret sauce” your company offers in each of your videos. Interested in hearing more on what marketing solutions REBL Marketing can assist you with? Contact us today!